The flowability of a cohesive powder is determined by shearing specimens compacted and tested under various compressive loads. The resulting family of yield shear stress versus the compressive normal stress relationships, known as the yield loci curves (YLCs), is used to calculate the principal stresses from which the flow function of the powder is constructed. Individual YLCs have been frequently described by the Warren–Spring equation, whose parameters are cohesion , tensile strength and curvature index . 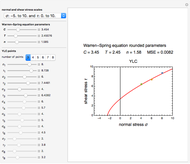 These three parameters can be estimated using Mathematica's Manipulate function by matching three or more experimental shear stress-normal stress data points with a YLC generated using the Warren–Spring equation as a model. Snapshot 4: YLC of an almost perfectly free-flowing powder. Notice that and are not allowed in the model. Quantification of the flowability of a cohesive powder is based on shear analysis of compacted specimens [1, 2] which gives a family of yield loci curves (YLCs). These are used to calculate pairs of principal stresses, the major consolidation stress and unconfined yield strength, for each consolidation level, derived from two constructed Mohr semicircles, tangent to the YLC. where and are the shear and normal compressive stresses, respectively, is the cohesion, is the tensile strength, and is the curvature index . When has been determined experimentally with a special instrument, and there are a sufficient number of points along the YLC, the Warren–Spring equation parameters and can be determined by nonlinear regression. This, however, is not always a practical option, and hence the need to estimate all three from a few experimental points. 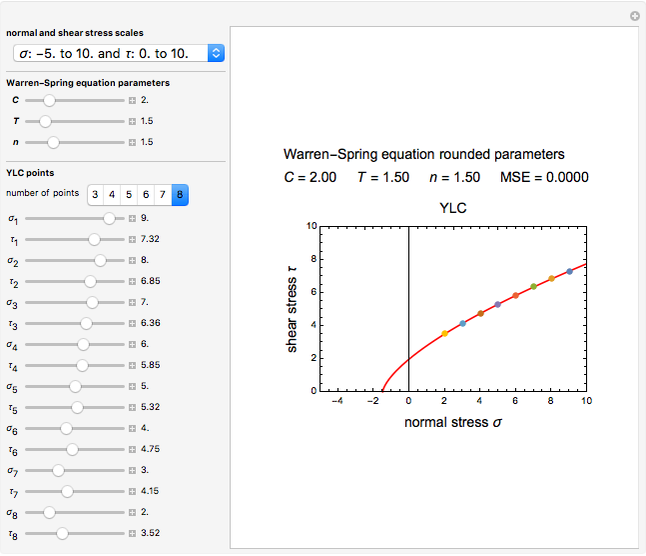 The purpose of this Demonstration is to estimate , and by visually matching three or more experimental shear stress-normal stress data points with a corresponding YLC generated using the Warren–Spring equation as a model. The visual match is assisted by a displayed mean squared error (MSE) for fine tuning. 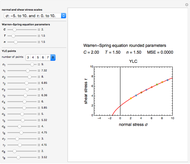 To start, select the normal and shear stress ranges from the popup menu. Then select the number of YLC points to be entered using its setter bar. 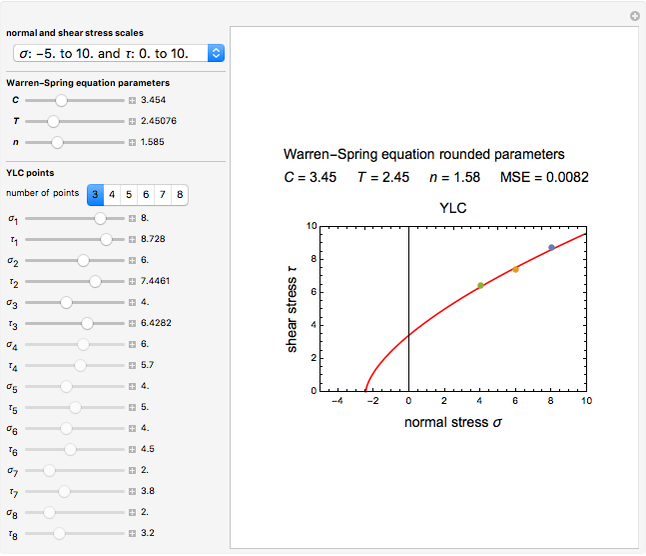 If the scale has been changed, the graphic display will be of a YLC generated using the Warren–Spring equation with the default parameter values, along with the chosen number of points at their initial default locations. Next, enter the coordinates for the data points and . Once they are all entered, move the , and sliders until a match has been reached. For increased accuracy, you can adjust the numerical value of the parameter after clicking the digit or digits to be altered. The final positions of the sliders are the sought , and estimates. Note that not all allowed entered values of and can achieve a match using realistic , and parameter values. J. C. Williams, "The Storage and Flow of Powders," in Principles of Powder Technology (M. J. Rhodes, ed. ), New York: Wiley, 1990. J. Schwedes, "Review on Testers for Measuring Flow Properties of Bulk Solids," Granular Matter, 5(1), 2003 pp. 1–43. doi:10.1007/s10035-002-0124-4. M. Peleg, M. D. Normand and M. G. Corradini, "Interactive Software for Calculating the Principal Stresses of Compacted Cohesive Powders with the Warren–Spring Equation," Powder Technology, 197(3), 2010 pp. 268–273. doi:10.1016/j.powtec.2009.10.003. M. D. Normand and M. Peleg. 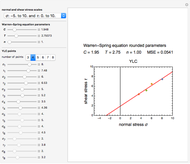 "Principal Stresses in Compacted Cohesive Powders" from the Wolfram Demonstrations Project—A Wolfram Web Resource. demonstrations.wolfram.com/PrincipalStressesInCompactedCohesivePowders. M. D. Ashton, D. C.-H. Cheng, R. Farely and F. H. H. Valentin, "Some Investigations into the Strength and Flow Properties of Powders," Rheologica Acta, 4(3), 1965 pp. 206–218. doi:10.1007/BF01969257. Mark D. Normand and Micha Peleg "Estimating Cohesion and Tensile Strength of Compacted Powders"